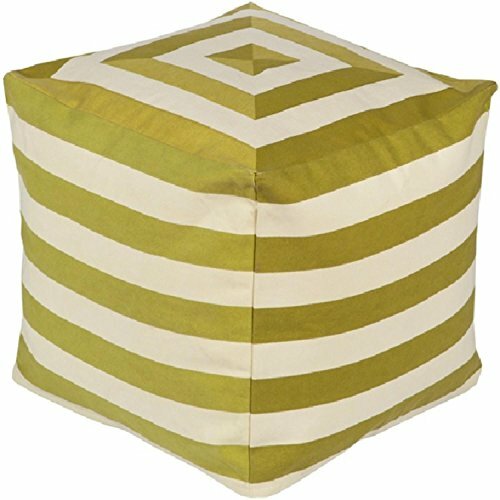 From the Playhouse Collection Durable pouf sports a trendy bold, striped pattern, that's a perfect touch to any decor. Color(s): palm, green olive and whitecap gray. For indoor use. Care instructions: spot clean only Dimensions: 18"H x 18"W x 18"D. Material(s): cotton A portion of the profits from these poufs goes towards a school lunch program that serves fresh, nutritious daily meals to 1.3 million children in rural India. For many children, this is their only substantial meal of the day. Additional donations are also made to a scholarship program that enhances literacy and learning in Southeast Asia. Nearly 80 percent of children from impoverished families drop out before graduation due to the burden of educational fees, books and uniforms. This program helps compensate for all school expenses in addition to mandating and paying for after-school tutoring for students most in need.